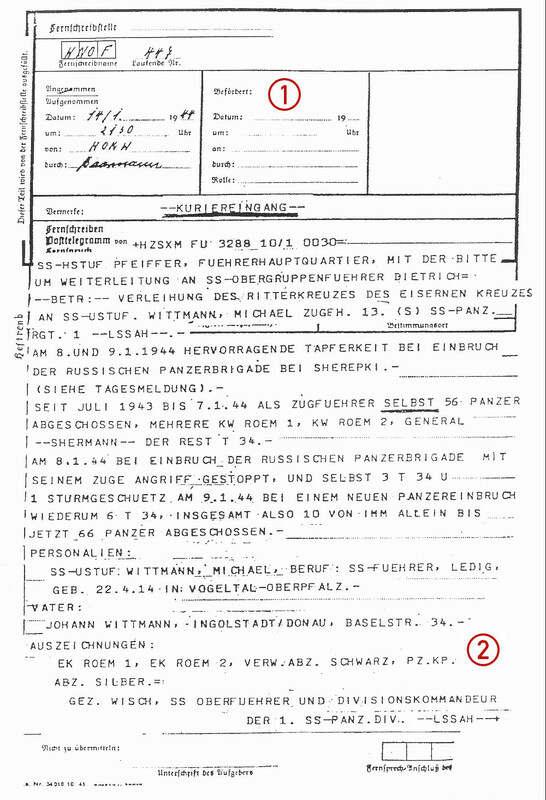 Copies of the telegraph message sent for the attention SS-Obergruppenführer Sepp Dietrich and the original recommendation for Michael Wittmann’s Knight’s Cross (Ritterkreuz) signed by Divisional Commander SS-Oberführer Theodor Wisch. 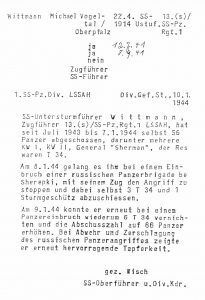 The telegram provides a detailed summary of Wittmann’s career up to that date, including his destroying 56 enemy tanks. The telex is dated 10th January, and was noted as received four days later. HZSXM FU 3288 10/1 0030. 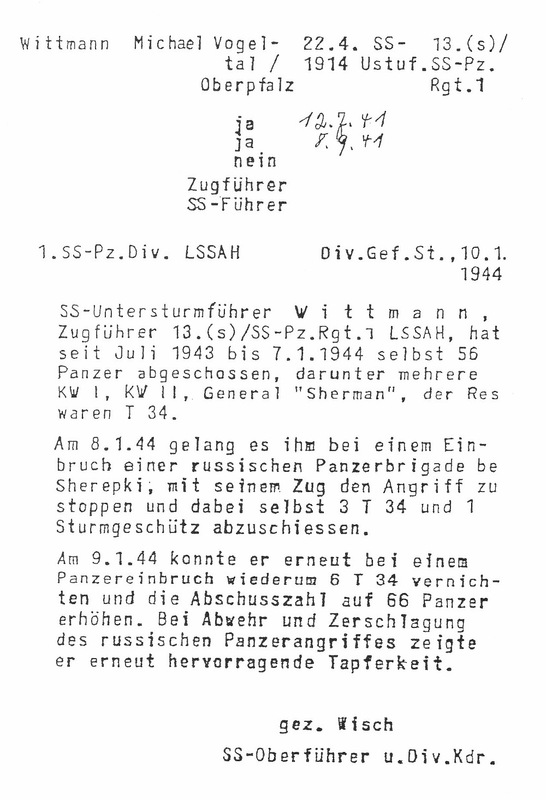 To SS-Hauptsturmführer Pfeiffer[Note 1], Führer Headquarters, requesting delivery to SS-Obergruppenführer Dietrich. On 8. and 9.1.44 Outstanding bravery during the breakthrough by Russian tank brigade at Sherepki. (See Daily Report). Since July 1943 to 7.1.44 as Platoon Leader he has destroyed 56 tanks himself, several KV I, KV II, General Shermans, and the remainder T34s. On 8.1.44 following breakthrough of Russian tank brigade he and his platoon halted the attack, himself destroying 3 T34s and 1 assault gun. On 9.1.44 following a new tank attack he destroyed another 6 T34s, making 10 by him alone and now 66 tanks destroyed. SS-Untersturmführer Wittmann, Michael, occupation: SS Leader, single. Johann Wittmann, Ingolstadt/Donau, Baselstr. 34. Iron Cross 1st Class, Iron Cross 2nd Class, Wound Badge in Black, Panzer Assault Badge in Silver,. 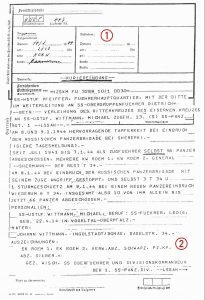 The typewritten letter of recommendation for Michael Wittmann’s award, dated 10th January 1944 and signed by Divisional Commander SS-Oberführer Wisch. The basis of this letter was sent as the telegram which was received four days later. SS-Untersturmführer, 13th (Heavy) SS Panzer Regiment 1. Note 1. SS-Hauptsturmführer Hans Pfeiffer, Hitler’s personal adjutant. Pfeiffer was later replaced as adjutant by Otto Günsche, moving to the front to command a company of Panther V tanks. According to Kurt Meyer in his postwar memoir Grenadiere, Pfeiffer was later killed in battle on 11th June 1944 after receiving fatal shrapnel wounds.